Objective : The one year Distance Learning Master of Library and Information Science (M.Lib.I.Sc.) Degree being conducted by The Global Open University, Nagaland has been designed for meeting the demand of the growing needs of experts in the fields of library planning and management, library networking, library resource management, book and journal procurement, preservation and conservation of published materials, on-line and digital library services, library science research etc. Award : Master of Library and Information Science (M.Lib.I.Sc.) Degree shall be awarded to all the successful candidates by The Global Open University, Nagaland. Emerging Technology in Library Sc. 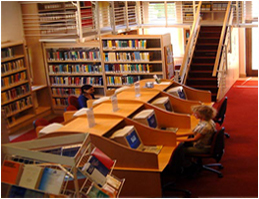 Library and Information Science is a diverse field that applies the practices, perspectives, tools and techniques of management and information technology along with education and related areas to libraries; the collection, organisation, preservation, and dissemination of information resources; and the political economy of new age information. Millions of jobs are available in India and in the rest of the world in universities, schools and colleges besides the Central / Federal and the State Governments, International Bodies for managing their Libraries and documents.